Over Christmas, I came back with citrus from home–which I used to make some of my other favorite breakfast smoothies earlier this year. With the latest gift from mom’s garden, I decided to go back to making healthy breakfast smoothies–this time with kale! Since my very favorite smoothie from before was the Avocado Star Breakfast Smoothie, I decided to add some avocado to this one, too. What surprised me, though, was the unique creamy texture that the avocado (along with banana) added to this smoothie. Between that and the Greek yogurt, this smoothie sure packed a pow! 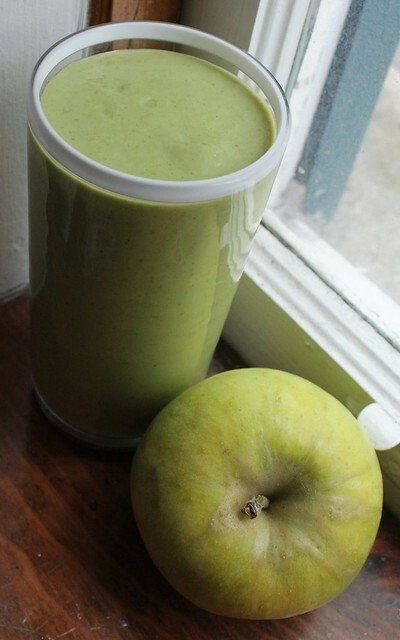 The delicious combination of avocado and banana adds a unique creamy texture to this filling breakfast smoothie with kale, Greek yogurt and apple. Combine kale and grapefruit juice into a high-speed blender, then blend until the kale is fully chopped. Add in the 0% fat Greek yogurt, lime juice, banana, apple and avocado. Blend. Finally, add in 1-2 cups of water and blend again until it has reached the desired consistency. What is your favorite ingredient to put into breakfast smoothies? This entry was posted in Breakfast, Shakes, Vegetables and tagged avocado, breakfast, Greek yogurt, kale, smoothie by Irina Gonzalez. Bookmark the permalink.